Did you know all library resources are FREE for OC students, staff, and faculty? The “Where can I get this?” link that appears in databases allows users to find articles or books in full-text from a source outside of the current source you are in (such as a database). If the article you want does not have a PDF or HTML full-text link, simply click on the “Where Can I Get this?” link, and follow the links that appear in the new window. When you click on the link, journals, books, reports and other items that OC library owns (either online or in the Library), are scanned for the document you seek. At the top of the screen, in a box, you see a citation for the item you want. You may need this information to locate your item in the linked database or resource. If no full-text is found you will see a message, and you can then place a request for an inter-library loan in the same window! ILLs are delivered to your campus library at no cost! E-books are available for users at no cost. You can view ebooks from on-campus or at home. One of our e-book providers, ebrary, even offers the ability to download chapters or pages of books that you can view offline, on your personal ereader (such as a Kobo or Kindle), or even your iPhone. For no charge! Campus libraries have DVDs and television series that users can borrow for free. Take a video home and watch it from the comfort of your own home. Videos and series are initially purchased to support course work. Some popular titles include Into the Wild, Brokeback Mountain, Pride & Prejudice, Avatar, Buffy the Vampire Slayer, Mary Poppins, Chronicles of Narnia, Charlotte’s Web, Black Swan, Criminal Minds, Up in the Air, Milk, Slumdog Millionaire, Iron Road, (500) Days of Summer, Revolutionary Road, and many more! Use the video/DVD limit in the catalogue to find video recordings. Have you seen what your library has to offer? If not, browse either in-person or online and see what you have been missing. Questions? Contact a librarian and we will be happy to help! Live Chat Library Help Service (AskAway) Now Open! Did you know you can get live help from a librarian from home or after library hours!? Even if you are at the library you can type your question into one of the AskAway chat boxes located on the Library’s website, in OCtopus, Research and Course Guides, EBSCO databases, Library web pages (listing of databases & e-journals, etc. ), or from right here. A librarian will respond within a few minutes. Post-secondary AskAway is a virtual reference service designed to help students, educators and researchers of BC colleges and universities. Librarians will answer questions, help you find information, suggest research strategies, help you construct citations, and more! You can even obtain your chat transcript at the end of your chat session, in case you want a copy of the help provided. If you are at home, working on an assignment after library hours, or would prefer to talk about your research or library needs online, this is a great resource! AskAway is open Sunday to Thursday 10 a.m. – 9 p.m., and Friday to Saturday 10 a.m. – 5 p.m.
To ask a question when AskAway is not open or to contact OC Library directly, you can do so by phone, e-mail, via our online form, or in person. If you unexpectedly lose the connection with the library staff person on AskAway there may be server issues; please try logging into the service to ask your question again. AskAway is an anonymous service to protect your privacy. The AskAway service receives and retains a copy of the chat transcript. and the College and Institute Act (R.S.B.C 1996, c.52, s. 41(1)(4)). please contact Sunni Nishimura, Virtual Reference Co-ordinator, 778.782.6937. Posted in Uncategorized | Comments Off on Live Chat Library Help Service (AskAway) Now Open! Attention all faculty! Placing a copy on reserve is now even easier. Faculty and instructors can now request copies of materials be placed on reserve by completing an online form and e-mailing or delivering the completed form to campus library circulation desks. Copies placed on reserve must comply with appropriate copyright law/licensing agreements. Click here for more information on Course reserves. After a review of its lost/damaged item procedures, OC Library has introduced some new criteria that applies to all OC Library users. If OC Library determines an item lost or damaged, you will be charged the item’s current cost and a $20 processing fee. Processing fees do not apply to faculty/staff. The current cost of the item (new) is determined by the Library. If an item is returned in good condition within six months of being declared lost, the Library will initiate a refund for the current cost amount and retain the processing fee. Click here for details on OC Library fines and fees. Avoid fines and fees by returning your items on time, or renewing them prior to due date. You may have forgotten about the contest held last term to name the Library’s new search engine (Ebsco Discovery Service). More than 100 entries were submitted and over 200 public votes were cast to decide the winner of the 2G iPod shuffle and of course, bragging rights. Thank you to everyone who submitted their suggestions, and to those who took the time to vote for their favourite name. Campus libraries are here for YOU! Library staff and librarians are here to help make your time at Okanagan College a little easier. When it comes to getting your assignments in on time, finding the resources you need to write your research paper, citing your sources, or anything else related to your course work, visit the Library and we will get you the help you need. If you are a faculty member we offer specific services to meet your needs. If you are not familiar with the services available (library instruction, reserves, interlibrary loan, media booking, collection development, etc.) visit the faculty services page on the Library’s website to see what you have been missing! Librarians are available to visit your class and provide instruction on using library resources or citing sources. Every department has a liaison librarian that selects library materials and provides instruction, do you know who yours is? OC Librarians also develop online resources specifically for students, and in some cases, for specific classes. Research and course guides (also known as LibGuides) are online subject and course-specific resources. Guides are available for some courses (for example ENG100 and BUAD116) and almost all subject areas. There are even guides providing instruction on how to research, how to cite your work, copyright, and how to use or access library resources. If there is a guide that you think would be helpful that is not already created, we want to know! Listing of Databases Where You Can Find Articles: Instructors will ask you to find articles or use peer-reviewed or scholarly articles when writing a paper. Use the Library’s ERM to find databases available to OC students and staff. The list is organized by subject area or alphabetically, you can search by keyword, or by type of resource you are looking for. For example, are you an arts student look for electronic resources that include eBooks? Select arts from the subject drop-down menu, then select the eBook limiter on the right side of the page. This will bring back all databases and electronic resources that are appropriate for the Arts that include e-books. E-Journals Listing: Looking to find a specific journal? Use the Library’s e-Journal (also known as CJDB) listings to find a specific journal and access it directly via the database it is indexed in. Library Catalogue: The Library catalogue is available to help you find books, media and other resources (such as journals, annual reports, government documents, and items in storage) that are available physically in one of the four campus libraries, or online. Using the Library catalogue you can search for items, request items and have them sent to your home library, renew items you have checked out, and check the status of items. The Library’s Search Engine: The Library has recently introduced a search engine that searches across the Library catalogue, databases, and e-journals. Using a single search box, users can find multiple different resource types, with results delivered in a single, relevancy ranked list. You can access the search engine using your internet-capable mobile device with the mobile version. Asking for help when you are drowning in assignments, struggling with research or when you are not having any luck finding resources can sometimes be a challenge. You do no have to worry though, there are many different ways you can get help. Library Reference Desks: Information desks are available at all campus libraries. Librarians are available at the reference desk to help with research, citation questions, and anything else you may need assistance with. If a librarian is unable to help with your specific question we will ensure that you are directed to get the help you need. Reference desks are different from the circulation desk where you check-out items from the Library. Depending on the campus library you are at, the reference desk may be located at the end of the circulation desk, or at a different location on the main floor of the Library. Ask a Question Online: If you would prefer to ask a question online there are multiple ways you can get help. 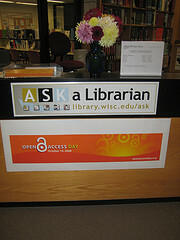 The Ask Us page on the Library’s website will direct your question to an OC librarian who will respond within 24 hours. You may have noticed the AskAway Chat Box located on the right side of the screen on many library web pages. AskAway is a live, online chat reference service maintained and manned by librarians from post-secondary institutions across the province. For more information about AskAway, including the hours it is available click here. AskAway will open for the term on January 23rd. Contact an OC Librarian Directly: OC librarians are responsible for liaising with departments within the College. If you are a student or instructor and would like to contact the Librarian responsible for your subject area, whether with a research question, to request instruction, or for any other reason click here for contact information. Contact the Library: You can always contact the Library directly. Click here to find contact information for each campus library, or visit the specific campus library web page available via the Library’s website. If you ever have trouble accessing the Library catalogue, any of the Library’s databases, or if you have ideas that you would like to see made a reality, please feel free to contact the Library. We love hearing from our users and are here to help! Posted in Uncategorized | Comments Off on Get To Know YOUR Library!